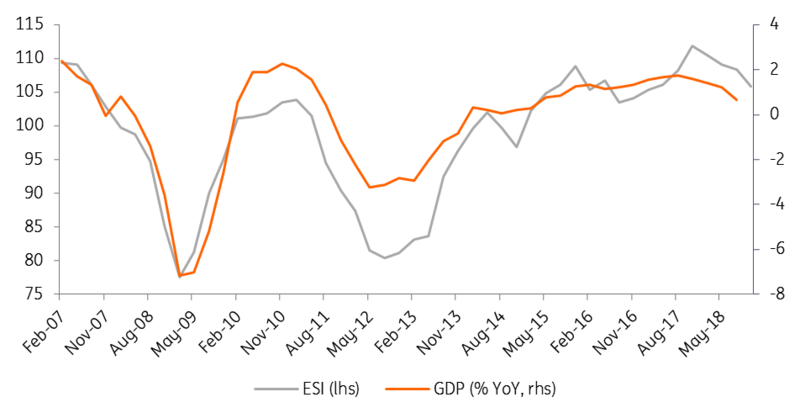 Economic growth continued to soften. Having expanded by 0.2% QoQ in 2Q18, Italian GDP contracted by 0.1% QoQ (+0.7% YoY) in 3Q18, on the back of softer domestic demand. Worryingly, but to some extent unsurprisingly, the main drag came from private investments, possibly affected by the poor visibility regarding the true economic and fiscal strategy of the unprecedented League/5SM government. The soft reading in private consumption was somehow more surprising when considering the consolidation of employment gains over the summer and growing evidence of tentative wage pressure. Net exports provided a marginally positive contribution to quarterly growth, thanks to a decent export performance, which materialised in spite of an already deteriorating international backdrop. Data evidence for 4Q18 points to a substantial risk of a technical recession. Istat confidence data has fallen further in the quarter, with the service sector finally joining manufacturing in the downturn as domestic demand concerns mounted. The PMI siblings have shown only partially similar patterns, with the manufacturing index stuck in contraction territory and the services measure managing instead to reach marginally back above the 50 threshold in November and December. While confidence in the retail sector recently rebounded a bit, this was not matched by consumer confidence, which dropped further albeit remaining at relatively high levels. The net impact on household consumption is uncertain, but a modest improvement in consumption data in 4Q18 cannot be ruled out. Given continuous tensions in the international backdrop, we doubt that net exports were able to propel quarterly growth in 4Q18. Poor November industrial production data, with a widespread contraction, contributed to tilt the balance of risks. On past form, both the ESI and the computed composite PMI indicator for 4Q18 are compatible with another 0.1% QoQ GDP contraction in 4Q18, implying a technical recession, which is now our base case assumption. The big question remains whether the current soft patch will turn into a nastier fully-fledged recession over the course of 2019. We do not buy into this story yet, as some of the pending uncertainties weighing on 2019 might hide positive surprises. Certainly, the chance of a swift reversal of fortunes for the Italian economy over 1Q19 look limited. The fundamentally more sound demand component looks set to be private consumption, supported by employment, which has stabilised at around pre-crisis highs, and by a likely recovery in real disposable income related to the energy-price-driven drop in headline inflation. Execution of the 2019 budget could potentially have an impact on growth prospects, particularly in 2H19. The core measures proposed by the populist government alliance, to be finalised soon in a government decree, could on paper be marginally growth-supportive, at least in the short run. More specifically, the introduction of a citizenship income handout will at first represent an injection of fresh cash in the pockets of the poorest brackets of the population. 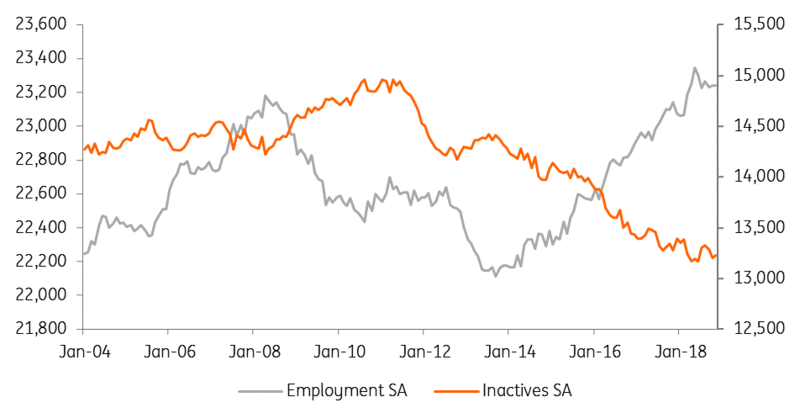 We are far more sceptical about its effectiveness in pushing up the activity rate on a sustainable basis, as this will crucially hinge on the effectiveness of employment centres, which is far from a given. Furthermore, a concurrent incentive for businesses willing to hire people under the programme might not be enough to convince employers to staff up in an uncertain demand environment, particularly in southern regions. Even harder to work out is just how expansionary for the economy the introduction of early retirement schemes for people who are at least 62 years old and who have a contribution history of at least 38 years could be; the timing and the extent of the substitution rate of such retirees with fresh new workers will be highly uncertain. Politics might also prove a relevant driving factor over 2019. The League and 5SM parties will have to play two roles at a time: that of a reliable partner in the government alliance and that of a stand-alone competitor in the all-important European Parliament election race (to be run under proportional rules). Playing both roles is likely to increase the probability of occasional clashes between the two. Episodes even since the beginning of 2019 on issues such as migrants (a stronghold of the League) and big infrastructure projects (a stronghold of 5SM) provide evidence of how the domestic political environment might look over the next 3-4 months under campaign polarisation spells. Does this mean that the coalition is set to collapse soon? Not necessarily, in our view, at least not before the European Parliament vote has taken place. It's well known that a government crisis would not necessarily mean imminent elections; Salvini could prefer to cash-in his huge potential support in the European Parliament election and leverage on it afterwards to twist the balance of power within the government while keeping the option open for a new right-centre alliance should domestic elections materialise. Latest opinion polls have 5SM at c.27% of the vote (down some 5-6ppt from the 4 March 2018 result) and the League at c.31.5% of the vote (up some 14ppt from the 4 March 2018 result).